I've met a few authors, but not in this setting, so the experiences were very different. Isn't it?? I was totally shocked by that (and SO glad I was in a front seat!). Awe...I love reading about people meeting authors they love! (I like to live vicariously through those of you who are actually brave enough to talk people you don't know. :P ) I'm so glad you had such a wonderful time, Andi! LOL, Debi! It was scary. I didn't know quite what to say, but he was very personable. Thank you! It IS awesome!!! I had no idea what to say, but that worked nicely. Which authors have you met, Amanda? Or which were your favorite? What fun!!!! What a gorgeous theatre too! 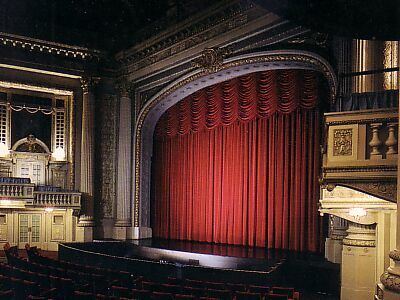 It's one of my favorite theatres. 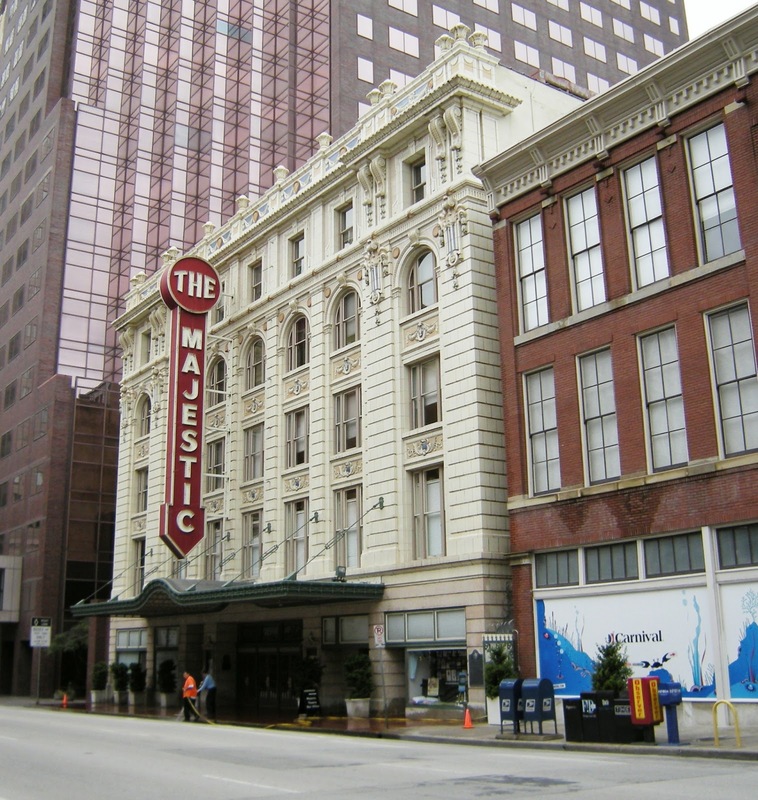 It was the first place I ever saw a live performance, and it was totally memorable. Yayyy! I hope you love it, Nadia! It was a memorable experience, and I'm so glad I loved the book. I considered not having Ocean inscribed in favor of something else, but now I'm glad because it makes it all the more precious. I'm still so depressed that I wasn't able to get tickets to his Atlanta stop this past weekend. And the fact that he's not going to be touring anymore makes me sad, but I understand. So glad you had such an amazing experience! I, too, have rarely met any authors (which seems crazy). I met Erin Morgenstern last year and babbled on about how my bookclub loved her so much. She might have looked slightly terrified! I'm so sorry you weren't able to go! I would've blubbered away if I'd met Erin Morgenstern. Seriously. Would've been starstruck. Almost was with Neil. Gaiman fans are so loyal and fab, I love that. And he's a big peach for sticking around and signing for so long. I LOVE your vlogs. I now want to read The Ocean at the End of the Lane. 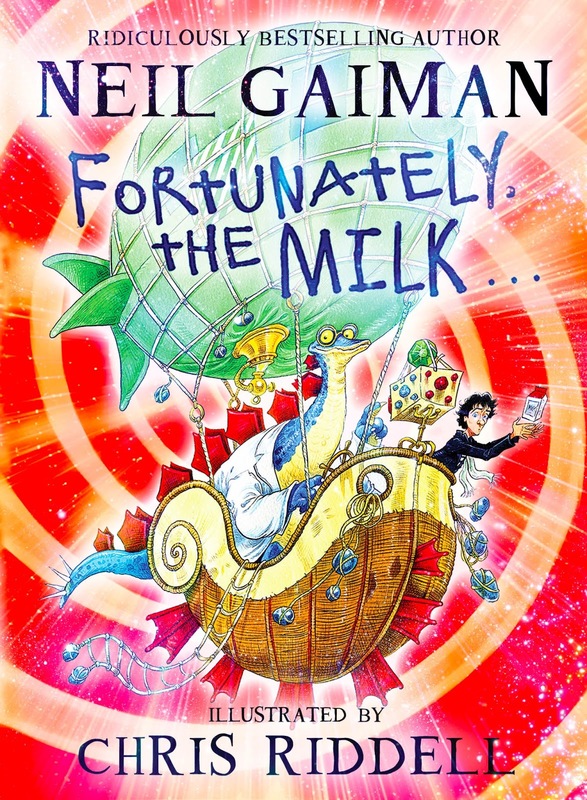 Like you, I've enjoyed Gaiman's work geared toward children a bit more than his grownup stuff, so I'm glad to hear your endorsement of this one! Thank you!!! I'm glad you like 'em. I never know if I should really include them or not. lol I hope you love Ocean as much as I did. So cool! And wow, that IS marathon signing. Glad you guys enjoyed it. Isn't it??? I was just amazed, but NO WONDER he's ending his touring after this year. Wowza. OMGosh, I was BEAMING when we left there. Pure joy. I can't imagine the physical therapy he'll need on his signing hand now! Crazy and looks like a great night. LOL, I know! It's unbelievable and kind of crazy. He said when he's done with a signing his hand is all cramped up into a claw and he doesn't understand plainspoken English words anymore. Your enthusiasm is contagious! 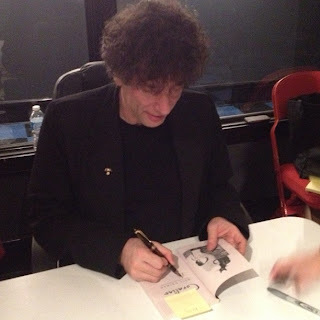 I'll confess that I'm a total Gaiman newbie and know nothing about him (beyond how beloved he is! 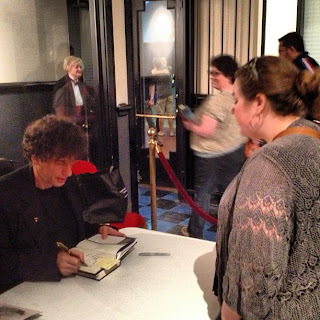 ), but I can definitely appreciate meeting a favorite author and the accompanying thrill. I met Jennifer Weiner a few years back and started chatting with her, and somehow I wound up giving her my blog business card (!). I doubt she ever had time to check it out, but just speaking to her personally and snapping a photo was so cool. Beyond that, I met Terry Brooks with my dad years back (he's a huge fan!) and once stood in line for four hours to meet Ree Drummond, the Pioneer Woman. Holy cow. That was fun but I will never do it again (and I don't think I could ever bribe Spence to get involved with that mess, either!). Oh I would've burbled and made an embarrassment of myself meeting Jennifer Weiner. You should totes try some Gaiman, Meg. The Graveyard Book or Ocean would be perfecto for you, I think. I haven't met any authors but, my dad met Francine Pascal (you know, Sweet Valley High?) when we lived in Italy. He helped her on board the ship. She introduced herself but told him he wouldn't know who she is because she writes children's books, and he laughed and said, "I know who you are! My daughter has every one of your books!" That is an AWESOME story, Monika! I love that your dad said that. I bet she loved it too. Yay! Glad you had such a great experience; i'm nervous myself. I believe the only author i've met at this point was Bruce Campbell (Ash from the Evil Dead movies). 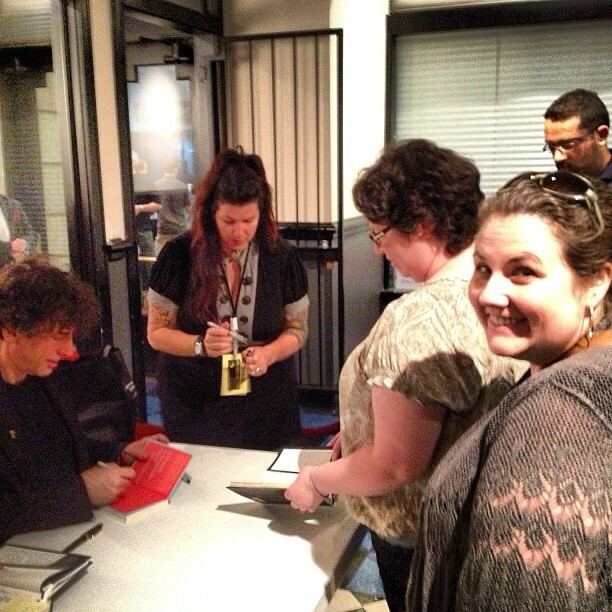 That is, i met him when he was signing one of his books; he was really funny! That's awesome, Melanie! I bet Campbell was a hoot. Don't be nervous. It'll be super fantastic. I went to the reading and signing session he had in Miami this past Sunday. It was an amazing experience! We waited for about 3 hours to have our books signed, but it was totally worth the wait. Jocelyn, you are a trooper! As I was looking back at the crowd, I thought to myself, "How long WOULD I wait?" I have the patience of a fruit fly, so it's hard to say. He was there signing until 2:30a.m.? Wow, I'm so impressed. Love it when an author really shows his appreciation for the fans! That's awesome. When you posted your pics I kept thinking where are they because I forgot that some Arts & Letters Live events aren't at the DMA. Sounds like a wonderful experience! YES! Isn't that pure insanity? But awesome for the fans. He really is delightful and gracious. This is so awesome! I need to get a job and start going to Dallas for awesome events like this! I need to read Ocean, it sounds so good! I'm glad you had such a wonderful time!! LOL, yes you do! I get annoyed with Dallas for not being more literary (just ain't gonna happen), but it made my heart SING to see so many enthusiastic readers and fans in one place. He seems like such a good guy. Everyone who's posted about meeting him has said how lovely and polite and engaged he is at his signings. Which I'm not sure I would be! It sounds exhausting! Oh my gosh you got to meet him!!! I got to meet him in 2010 and he really was incredibly wonderful. If you haven't read Stardust, which I'm guessing from your video you haven't, I would recommend it. He sounds charming. So cool that you got to see such a wonderful author and chat with him! Love the answer about black clothing. Amazing!!! I know you're a huge fan and have been consistently tweeting about this so yay!!!! It's always exciting to meet someone you really like!!! WAY COOL. I'm so jealous. It would have been incredible to see and meet him. Awesome! He seems like a great person. So glad you were able to meet him. 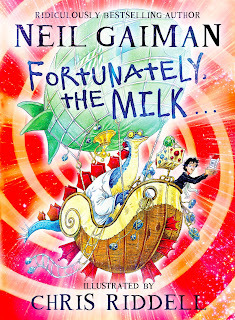 I've never read Neil Gaiman, but everyone seems to love him! I'm not usually a big YA/ sci-fi/ fantasy reader, but I'm all about expanding horizons. SO many books to read!